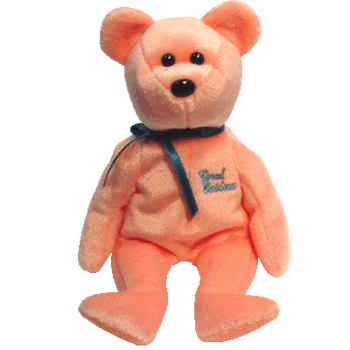 The Coral Casino bear is made from a coral pink colour with black button eyes and a larger black button nose. She wears a blue ribbon around her neck. On her chest are the words “Coral Casino” embroidered in blue thread. The Coral Casino bear was released on 9th December 2001. Coral Casino Club members received this bear as a gift at a dinner party at the Coral Casino Beach Club at the Santa Barbara Biltmore Hotel on 9th December 2001. 588 bears were produced with each swing tag signed by Ty Warner and numbered out of 588. Members who didn’t attend the dinner party received their bear in the mail with a letter.